Here’s the story: while my parents were in town, we all went together to one of our kids’ homeschooling events. My mom was talking about one of Joyce Meyer’s (concerts? outings? conventions? )—I’m not really sure what you call them—but she seemed to really enjoy it. 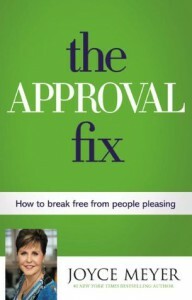 I saw this book upcoming, thought it may be similar to Brené Brown’s DARING GREATLY, and wanted to give it a try. I have a feeling many people like my mom will buy and enjoy this book. This review is for everyone else. The “approval fix” can come in many formats: seeking ‘likes’ on Facebook, getting praise from a boss, wanting acknowledgement for cleaning the house, and such. It’s not bad, but it can be like a drug; you need a fix. Some of the other books I’ve reviewed speak to this, where there is a difference between doing things for the purpose of gaining approval versus doing things for intrinsic value and graciously accepting praise if it comes. The things I like about the other books are footnotes. Lots and lots of footnotes. Joyce Meyer doesn’t offer any footnotes or scientific research. Some may say she “shoots from the hip.” Yes, she uses many scriptures throughout, but there are large segments of text without any reference. Most of what she speaks to comes from her years involved in the ministry and from her own life. She seems transparent in her reassuring delivery. The bottom line: God accepts us for who we are. We are loved. All the approval we need comes from Him. Overall, this is a solid offering for believers seeking that reassurance and foundation. The advice contained here does not prohibit or inhibit, but rather sets up a path of a life not bound by expectations. When we are free to be ourselves and the persons God wants us to be, then that is truly beautiful. Thanks to FaithWords and Hachette for providing an electronic copy of this book.